Education is extremely important to us! Continuous Learning enables us to provide better strategies and insight to our clients so that they can make more informed and confident decisions about their financial future. Our goal is continuous improvement to increase the value we provide to our client relationships. Learn more about our designations below. The Global Financial Steward® (GFS®) is the first leadership and stewardship designation developed for the financial services industry. Designees have been trained on a new body of research called LeaderMetrics®, which can be used to examine the effectiveness of a decision-maker serving in a critical leadership role. The LeaderMetrics® framework can be used to substantiate multiple professional standards of care, including a fiduciary, governance, project management, global wealth management, and life insurance best practices standard. Obtaining the BEI Certified Exit Planner (CExPTM) designation is the final step to building your knowledge of comprehensive Exit Planning services for the business owner community. Through training and rigorous testing, CExPTM professionals demonstrate they are qualified to provide skilled and professionally executed Exit Planning services. Business Enterprise Institute (BEI) is the leading innovator in the Exit Planning industry. No other organization offers its Members the comprehensive Exit Planning training, marketing support, and plan-creation tools that BEI provides. As a Member of BEI, advisors have access to an established, systemized process that allows them to easily help their clients with their business-transition planning. Professionals in a variety of disciplines leverage Exit Planning to attract and keep high-caliber business clients in their practices. The Accredited Investment Fiduciary® (AIF®) designation represents a thorough knowledge of and ability to apply fiduciary practices. Through fi360’s AIF® training programs, AIF® designees learn these practices and the legal and best-practice framework they are built upon. AIF® designees have a reputation in the industry for the ability to implement a prudent process into their own investment practices, as well as being able to assist others in implementing proper policies and procedures. A Chartered Financial Consultant® (ChFC®) is a professional designation representing completion of a comprehensive course consisting of financial education, examinations and practical experience. Chartered Financial Consultant designations are granted by The American College of Financial Services upon completion of seven required courses and two elective courses. Those who earn the designation are understood to be knowledgeable in financial matters and to have the ability to provide sound advice. Advanced planning for every person, every need. That’s the promise of a Chartered Financial Consultant®. The FFI Global Education Network (GEN) is a global forum for teaching and learning, offering cutting-edge multidisciplinary courses and world-class certificate programs for family enterprise advisors, consultants, academics, and other professionals. 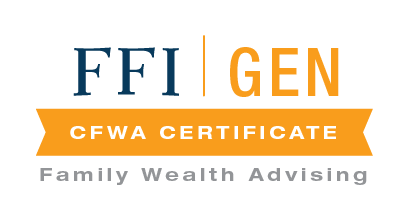 FFI GEN is the educational arm of the prestigious Family Firm Institute, the leading membership association worldwide for professionals serving the family enterprise field. 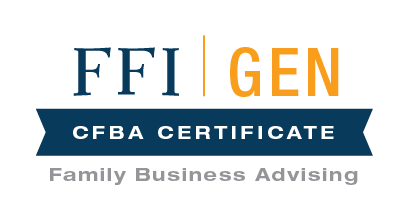 Those who earn the Certificate in Family Business Advising (CFBA) and/or Certificate in Family Wealth Advising (CFWA) have achieved significant professional knowledge by fulfilling all program requirements, ensuring that their clients will continue to benefit from the highest standards in professional best practices for family business advisors. The premier designation for insurance professionals. Launched in 1927, the Chartered Life Underwriter (CLU®) is the insurance profession’s oldest standard of excellence. Today, it continues to be the credential for practitioners who desire to provide their clients with the security of life insurance and risk management. The Purposeful Planning Institute (PPI) attracts individuals and firms who believe there is a better way, a better process, a better practice lying just ahead of us and that our past experiences and knowledge are merely a prelude to our finest hours in service to our clients. It is the most affordable and easily accessible educational and training platform for advisors to HNW and UHNW clients. PPI offers great value through our easily accessible educational content, programs, and training for financial advisors, estate planning attorneys, and other professionals and consultants serving families of wealth and families in business. Although many professionals may call themselves financial planners, Certified Financial Planner™ professionals have completed extensive training and experience requirements and are held to rigorous ethical standards. CFP® professionals are obliged to uphold the principles of integrity, objectivity, competence, fairness, confidentiality, professionalism and diligence as outlined in CFP Board’s Code of Ethics. The Rules of Conduct require CFP® professionals to put their clients’ interests ahead of their own at all times and to provide their financial planning services as a “fiduciary”—acting in the best interest of their clients.